While the terms Minnesota Private Cemetery – Minnesota Private Cemeteries are not defined by any Minnesota statute, the term Minnesota Public Cemeteries is defined by M.S., Section 306.87.
before all that went in at the gate of his city. Therefore, according to the above – somewhat circular – definition of Minnesota public cemeteries, Minnesota private cemeteries are those established by religious corporations – which may be formed pursuant to either M.S. Chapter 315, or M.S. Chapter 317A.
. . . the language or context [of M.S., Section 306.87] clearly indicates that a different meaning is intended . 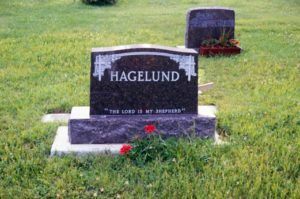 . .
Minnesota private cemeteries are primarily governed by Minnesota Statutes, Chapter 307 – a body of law containing only 14 sections – although a number of sections in Minnesota Statutes, Chapter 306 are also applicable to Minnesota private cemeteries. Many Minnesota religious corporations are governed by Minnesota Statutes, Chapter 315 – a body of quasi-corporate law which loosely governs Minnesota religious corporations, religious societies, and to some extent, their cemeteries. including, but not limited to, many churches – and indirectly, their cemeteries. as they appear now in the 1913 General Statutes, § 6316 et seq. It thus appears that until 1903 a religious corporation was not authorized by name to establish a cemetery under this statute. In re Front Street Sewer Assessment, 138 Minn. 67, 69, 163 N.W. 978, 979, 1917. The land shall be surveyed and a plat thereof made. A stone or other monument shall be established to mark one corner of such cemetery, and its location shall be designated on the plat. with such endorsement shall be filed for record with the county recorder in the county where the cemetery is located, showing the area and location of the cemetery. M.S., Section 307.01 presumes that a religious corporation establishing a Minnesota private cemetery has already been organized pursuant to some other body of law. Picha’s application met all conditions. Picha’s request is for a private cemetery, which is a permitted conditional use. impede the normal and orderly development of the surrounding vacant property. committed to compliance with Minn.Stat. § 307.01 relating to cemetery survey requirements. Picha v. County of McLeod, 634 N.W.2d 739, 743 Minn.Ct. App. (2001). one of such markers showing the number of the lot. Every conveyance of such lots shall be expressly for burial purposes, . . .
for the uses and purposes thereon indicated. Presumably if an individual has established a Minnesota private cemetery on the person’s own land, trustees and successor trustees would have to be appointed to maintain and administer such common areas. Additional requirements with respect to the permissible grantees of any deeds of conveyance in Minnesota private cemeteries would be identified in the rules and regulations of the private cemetery. However, the Minnesota Supreme Court did confirm that racial restrictions imposed by public cemetery associations were void, and of no effect – pursuant to M.S., Section 507.18.
those which are hierarchical in nature – where the society’s leaders are in charge. only limited application to religious societies which are subject to Chapter 315, since many of its statutes only apply to certain forms of religious entities. perhaps identified the church synod or denomination with which the religious society would be affiliated, or to which it would be subjected. Bylaws – another internal religious society document not filed with any governmental agency – containing provisions governing the religious society’s affairs which may be given a lesser status than those contained in any Constitution of the religious society. the less important provisions listed in Bylaws. Sometimes, the headquarters of the denomination in which the religious society is a member may either require, or suggest, the adoption of a Constitution and Bylaws which contains certain provisions. Often, there is a different, and more difficult, procedure required to amend a religious society’s Constitution, than to amend its Bylaws. neither the Certificate of Incorporation, nor the Constitution and Bylaws of the religious society can be in conflict with any applicable provisions of Chapter 315. Many Minnesota Chapter 315 religious corporations are under the direction and control of “trustees” or “elders”. Other Minnesota Chapter 315 religious corporations are under the direction and control of bishops, chancellors, wardens, ministers, elders, vestrymen or other persons. dispose of money belonging to it. They may regulate the . . . the breaking of ground in their cemeteries. However, religious corporations sometimes limit the transactional powers of such trustees or elders by requiring that resolutions with respect to certain types of actions first receive the affirmative vote of a certain percentage of the members of the religious society’s voting members. as distinguished from the corporation itself. Between 1951 and 1991, some Minnesota non-profit corporations were governed by Minnesota Statutes, Chapter 317, the predecessor body of non-profit corporation law to Chapter 317A. Former M.S Section 317.05 identified that a Minnesota nonprofit corporation could be formed under that chapter for any lawful purpose, including a religious purpose. The term religious corporation has been part of the statutory language which is used to identify a Minnesota private cemetery since at least 1911. However, Minnesota Statutes, Chapter 317A became effective on August 1, 1989, and its predecessor body of law, Minnesota Statutes, Chapter 317 was adopted in 1951.
and no other chapter of Minnesota Statutes. The 1894 and 1905 religious corporation statues were eventually reorganized in 1941 as Minnesota Statutes, Chapter 315. Nevertheless, the statutory language in Chapter 317A making reference to religious corporations may qualify corporations formed under that chapter as entities eligible to organize and operate a Minnesota private cemetery. creation, maintenance, investment, management, and disbursement of necessary endowment, reserve, and other funds for these purposes, including a trust fund or corporation that funds a “church plan” as defined in section 414(e) of the Internal Revenue Code of 1986, as amended through December 31, 1988. . . .